grandma's cookie jar: Let's Have a Fun Family Movie Night Tomorrow with Home! Let's Have a Fun Family Movie Night Tomorrow with Home! If you are looking for a fun idea for something you could do with your family tomorrow, Friday, June 26, 2015, check this out! Family Movie Night can always be a time for families to just have fun together and the release of the movie, Home, is definitely, "fun". Add to this the opportunity to win prizes, well . . . sounds like all you need is to pop up some pop corn, roll out the pizza and get ready to laugh and enjoy your evening with your family! In case you are not familiar with the movie, Home, here is a little info for you . . . It is based on Adam Rex's 2007 children's book The True Meaning of Smekday. The story is set on planet Earth, where an alien race called the Boov is on the run from their enemy the Gorg and think Earth is a great place for them to live. Led by Captain Smek (Steve Martin), the Boov move the humans to other parts of Earth during their "friendly invasion" - this is so the Boov can live in the humans' homes. One of the Boov, named Oh (Jim Parsons) decides to invite all the other Boov to his apartment for a housewarming party. He hits "reply all", which actually sends his invitation to every alien race in the entire galaxy, including the Gorg. Not far from Oh is a young girl named Tip (Rihanna), who is driving around looking for her mother Lucy (Jennifer Lopez) with her cat. Oh runs into Tip and when her car won't start; Oh transforms it into an amazing hovering craft which runs on slushies. Oh promises to help Tip find her mom and rides along for a truly crazy adventure which will leave you laughing. Since I don't want to "spoil" the story for anyone who has not already watched Home, I'll leave it here and just say, it is a movie which your family will enjoy and will provide opportunities for you to talk with your grandchildren/children about important things like family, keeping your promises, stealing, forgiveness and more! 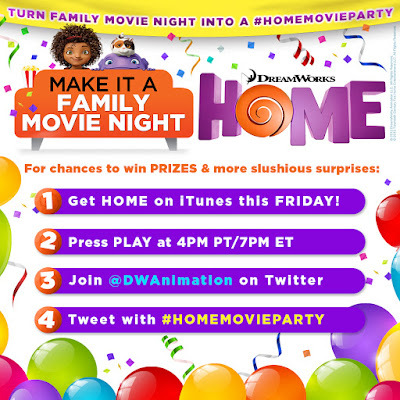 So, since Home from Dreamworks Animation and Fox Home Entertainment is hitting Digital HD this Friday, June 26, 2015, they are inviting you to join in and celebrate with a Twitter party with director Tim Johnson! 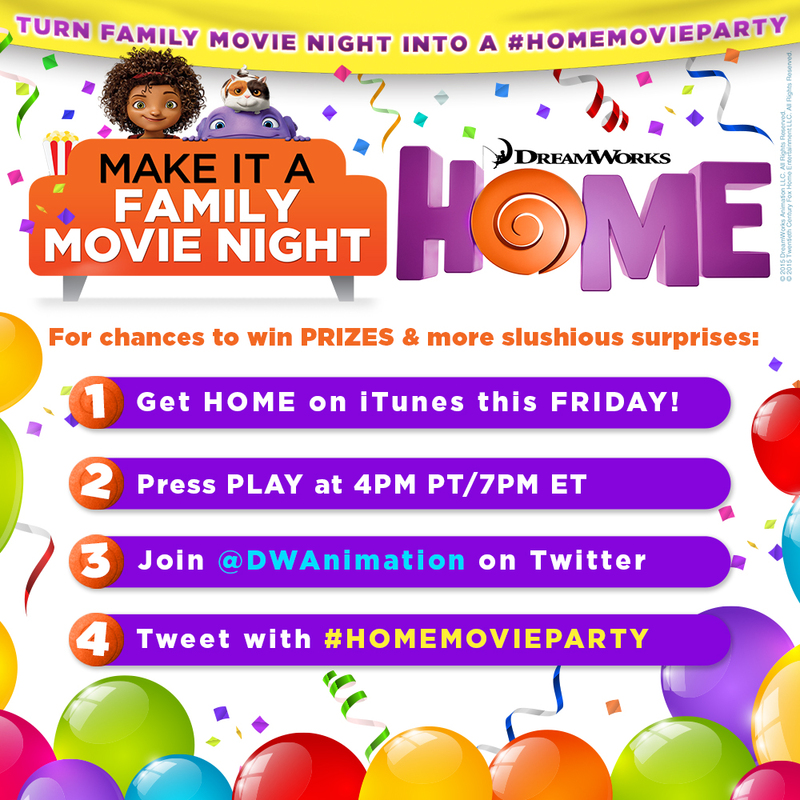 You can join the fun by watching Home and tweeting during the movie - #HomeMovieParty! Who knows??? Maybe you will win a fun prize . . . and you are sure to have a fun evening together with your family!